Copy this link to share the current map location and layer information. 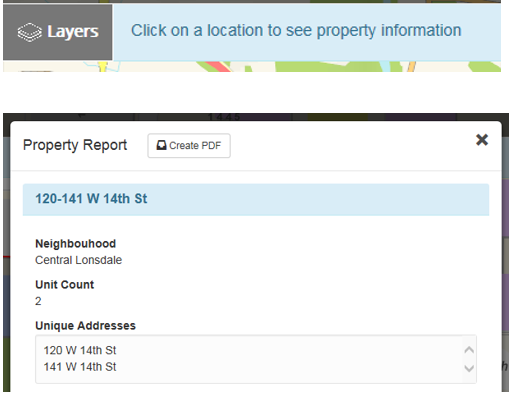 Search Bar: Use the predictive search to find addresses, layers, tools, schools, parks, roll number etc. Just start typing and select from the results. 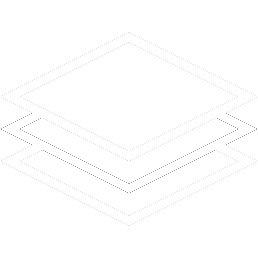 Layers: Expand the Layers tab to access the Basemaps Aerial Imagery, Map Layers, and Legend. Basemaps: Expand the Basemaps arrow to access the Wireframe, 2007-2017 Aerial Images, Colour Theme, and a new Grey Theme basemap option. 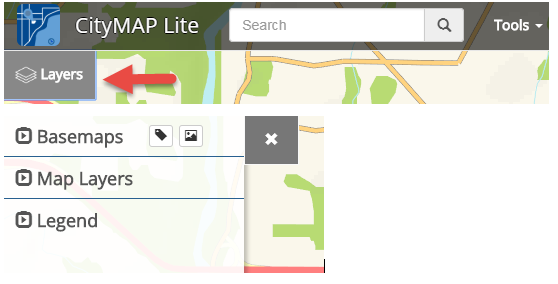 Click the Aerial labels toggle icon to turn address labels on and off with the images, Wireframe, or Grey Theme. 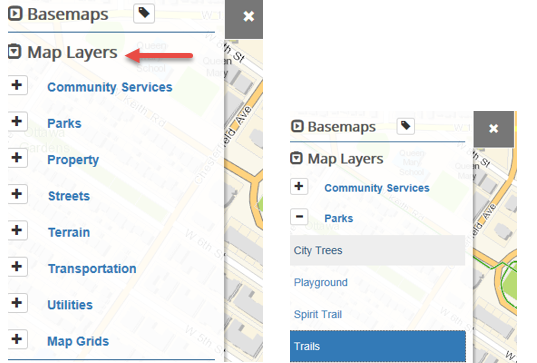 Map Layers: Expand the Map Layers arrow to access the different categories of layers. Click the plus sign to view layers within a specific category. Highlight a layer to turn it on/off. Legend: Expand the Legend arrow to view the features currently displayed on the map. Click on the Tools text and arrow to expand the action features available. 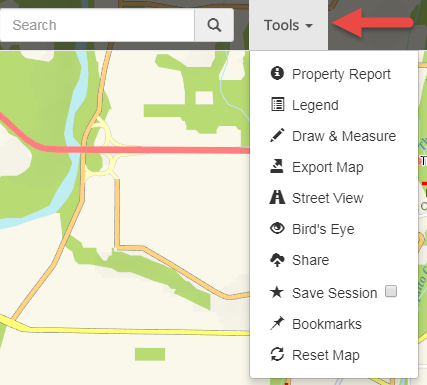 Property Report:Choose 'Property Report' from the Tools drop down and select your property of interest. 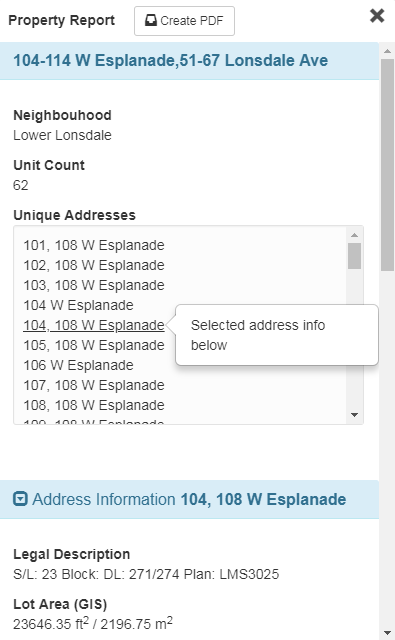 If the property is a strata, you can select individual addresses within the Property Report to find information specific to that strata unit. This version of CityMap will work on any mobile device or modern browser which has an internet connection. It is designed to be interactive so please use your touch screen to zoom in / out; pan; enter search criteria; turn on layers; and drill down for information. New: CityMap has been given a makeover ! We have not taken away any of the functionality of the old map but have freshened up its look and made it mobile friendly. We hope you will find it simple and intuitive to use but have included an introductory video here just in case it is needed. The City of North Vancouver makes no guarantee or warranties whatsoever, either expressed or implied, with respect to the accuracy or quality of information, content, or materials, and disclaims all responsibility for the accuracy or completeness contained herein.